The need for effective corporate communication is growing as workplaces continue to become larger and more dispersed. Corporate video has become mainstream for today’s employee education, training, corporate communication, marketing and advertising, helping to improve overall communications and reduce costs. As larger amounts of high-quality video content is produced, stored and managed by modern enterprises, in-house corporate media professionals are seeking many of the same high performance file storage solutions used by large film studios and media production companies to render, edit and archive their video workflows. 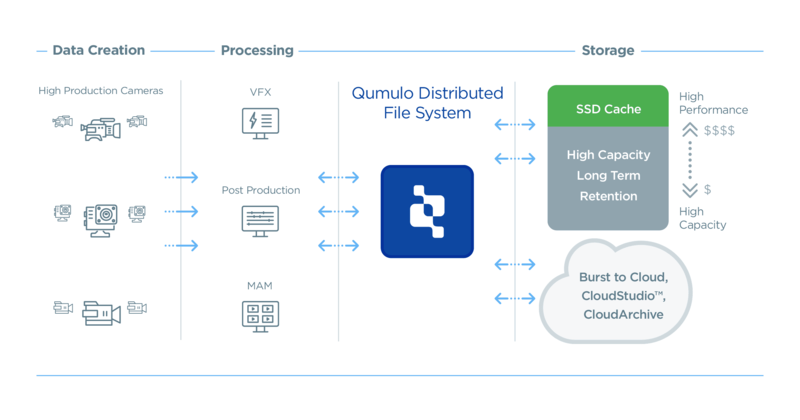 Qumulo hybrid cloud file storage meets the needs of today’s corporate video content production and storage; providing a modern infrastructure employing flash-first technology which can handle the toughest HD, 4K or 8K workloads, and providing limitless scalability to manage ever growing capacities. Qumulo enables easy collaboration with unified data accessibility, and the ability to transition to hybrid cloud environments, or burst an existing workflow to the cloud to accelerate productivity, when needed. Qumulo efficiently secures valuable video assets with robust data protection with the economics of archive storage. Qumulo file storage easily integrates with popular video production applications using existing ethernet-based enterprise infrastructures, without the need for complicated and costly FC SAN or Infiniband. Powerful flash-first technology, can manage 4K or 8K workloads, ensuring fast and smooth playback and editing of video footage, even when there are multiple editors working with multiple streams of footage. Qumulo stores all data in a single global namespace, allowing multi-location production teams to easily access content, collaborate, and meet project deadlines faster. Qumulo’s CloudStudioTM offering enables organizations maximum flexibility and choice on how to manage corporate video production. Without the cost of additional internal resources, an organization can simply employ Qumulo for their video production workloads using either Amazon Web Services (AWS), or Google Cloud Platform (GCP), to create a studio in the cloud. Qumulo provides a simple, scalable, and cost-effective solution that is a modern replacement to traditional SAN-based infrastructures. The hybrid cloud file storage solution scales across economically and gives you control, with no vendor lock-in; lower-cost commodity nodes can be added to the existing infrastructure to increase both performance or capacity levels as required, with no disruption or downtime. Qumulo ensures the most cost effective, fail-proof data protection for petabyte levels of corporate video content with the use of erasure coding. Data is protected for the long-term with minimal storage overhead, requiring no extra software or tiering strategies. In addition, enterprise organizations can benefit from this efficient approach to data storage, which enables the use of 100 percent of usable capacity purchased, unlike many file system solutions which reserve 15-20 percent of purchased capacity for system administrative tasks. Qumulo provides continuous replication across storage clusters for disaster recovery purposes. Once a replication relationship between a source cluster and a target cluster has been established and synchronized, Qumulo automatically keeps data consistent. Qumulo provides administrators cloud-based access to real-time analytics to monitor performance, capacity, and usage of the file storage, to gain insights to manage issues before they occur, and to proactively make decisions for planning future growth. Qumulo integrates seamlessly with existing network and popular video production applications.